Our diploma courses are designed for students who want real hands-on experience within a thriving upholstery studio. Passionate and experienced professionals will teach you their craft as well as impart their real-world knowledge of the upholstery industry. This gives you the tools to develop your own personal style, as well as enhancing your employability or giving you the confidence to set up your own upholstery business. Students are taught through a variety of practical projects, which also makes the courses perfect for those who wish to develop their craft as a hobby. All diploma courses offer flexible attendance and can be broken down into weekly or fortnightly slots. This gives you the opportunity to practice what you’ve learnt at home and manage your learning in easy-to-digest chunks. Courses take place from Monday to Thursday, 9am-5pm. The cost is £385.00 per week, plus materials. We provide our own tools, although we’re also happy to supply them to students who wish to purchase their own. For further information or to book your place, just contact us via our contact page here. Alternatively, give us a call on 01539 592786. This two-level programme is designed to give students a high level of proficiency in upholstery. When you complete this course, you’ll leave with the skills and confidence to work independently and embark on complex upholstery projects. This is a practical course, with no written coursework or exams. However, at the end of the programme you will leave with an impressive body of work and a portfolio, which will document the skills and techniques you’ve learnt with us. 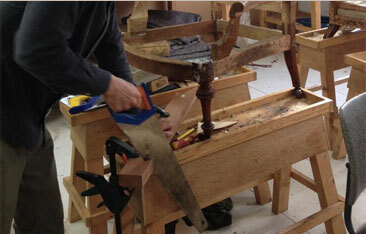 Students will graduate with an Advanced Diploma in Upholstery, issued by The Oxford School of Upholstery. This programme is designed to introduce students to the foundation techniques of upholstery, enabling them to tackle many projects with ease. It’s also perfect for beginners who wish to develop their hobby further. You will spend your time gaining proficiency in upholstery techniques and with sewing machines, producing scatter cushions, box cushions and bolster cushions. You’ll also embark on more complex projects such as producing a sprung seat with a curved edge and an upholstered back; a traditionally upholstered nursing chair and a sprung stool with stitched square corners. Students will graduate from this first level with a certificate in Foundation Diploma in Upholstery from Oxford School of Upholstery. The advanced diploma will enable students to become proficient in both modern and traditional upholstery techniques. The course will consolidate students’ understanding of the foundations of upholstery while covering a number of advanced techniques. You will be involved in a number of large and exciting projects, including the upholstery of a wing back chair (using modern methods), a traditionally upholstered armchair with an independent sprung edge; and a chair or two-seater sofa with separate cushions and fitted skirt. 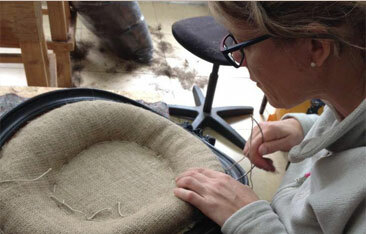 Students will graduate with a certificate in “Advanced Diploma in Upholstery”. To find out more about this course download our PDF.